One package of 12 X 12 Berry Blossoms Designer Series Paper package is all I've used for the many projects I've shown over the past few weeks. Each time I reach for this pack of Designer Series Paper, I get a little tickle of joy. 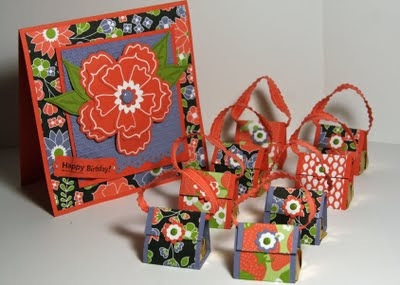 Here's my latest project using Berry Blossoms Designer Series Paper... the venerable nugget purse. We all know that this cute purse design has been around forever. 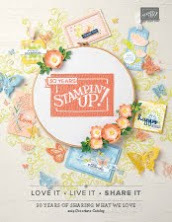 However, when I saw Mary Fish's nugget purse samples I knew I would finally create my own samples using Berry Blossoms DSP. Here's what my nugget purses look like with one of the cards I created in an earlier post. 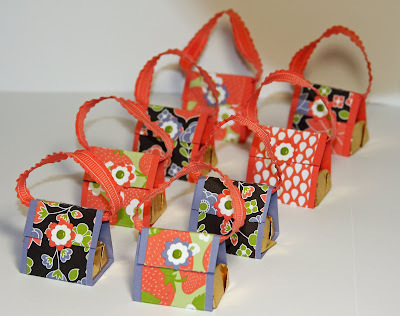 I used 5" of Ruffled Calypso Coral ribbon for the purse handles, attached with Red Sticky Strip tape. Most nugget purses are made using the 1/4" grosgrain for the handles. I changed the dimensions slightly to accommodate the 3/8" Ruffled Ribbon. Cutting Dimensions: My measurements accommodate the 3/8" wide ribbon. If you use 1/4 ribbon, you may wish to change your dimensions. 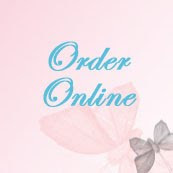 Berry Blossoms Designer Series Paper(DSP): 1-1/4 X 4-3/4" Adhere DSP to cardstock. Score along the long side at 1-3/16", 2-3/16", 3-1/2, and 3-7/8"
Create sharp creases with your Bone Folder along the score lines. 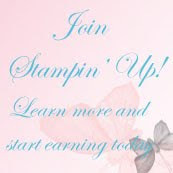 Add the Ruffled Ribbon before closing the nuggey purse. 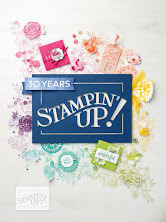 To order Stampin' Up products on-line at my store, shipped direct to you address, click here. These cute treats would make wonderful favors or quick nibbles when you don't have time to bake or cook.